In this explanatory essay, a 2nd grade student explains the customs of a national holiday. Every fourth of July Americans celebrate Independence Day. This awesome holiday includes many customs. During the day, families get together for picnics and parades. People wear red, white, and blue and wave American flags. But the best part happens at night. That's when everyone gathers to watch fireworks! Colorful bursts go boom and light up the sky. Some kids even get to carry sparklers. All these customs make Independence Day a very special holiday. 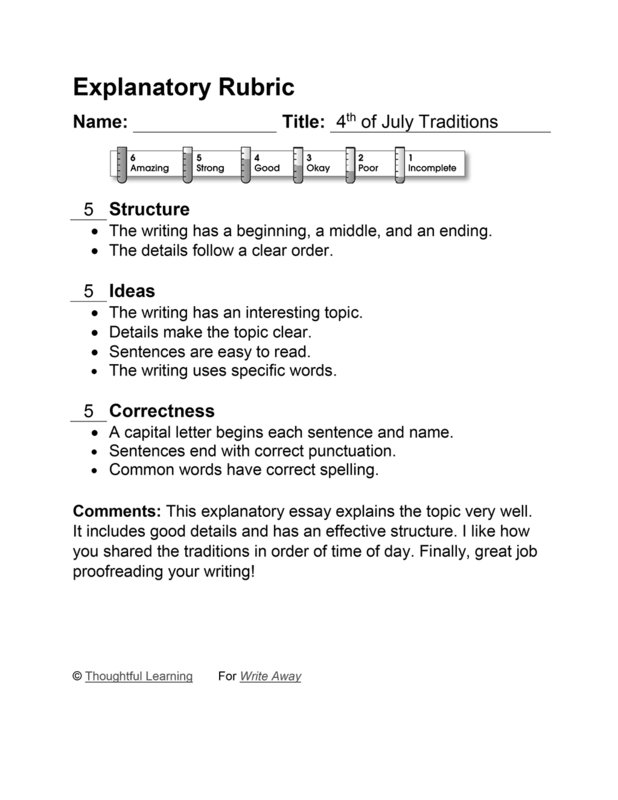 4th of July Traditions by Thoughtful Learning is licensed under a Creative Commons Attribution-NonCommercial-ShareAlike 4.0 International License. Based on a work at k12.thoughtfullearning.com/assessmentmodels/4th-july-traditions.